I like fairy tales. I also like fairy tales re-imagined, but not all of them. For instance, I hated Gregory McGuire’s “Wicked.” I thought it disrespected Baum’s innocent vision of Oz, though obviously I am in the minority, and Gregory McGuire is now a rich man. On the other hand, I loved McGuire’s “Lost,” which skillfully weaves together Dickens’ “A Christmas Carol,” shades of Jack the Ripper, and some other goodies into a gripping ghost story. Elsa, our protagonist, is seven years old and precocious, but I am happy to say she is precocious in a believable, seven-year-old way. Her grandmother is a character, to put it mildly. Among other things, Elsa’s grandmother has taught her a secret language and told her stories of the several kingdoms of the Land of Almost-Awake. Her grandmother is her super-hero, and Elsa adores her. In fact, Granny is Elsa’s only friend, because Elsa doesn’t think much of the kids at school who don’t understand great literature. Like “Harry Potter.” And Marvel Comics. Elsa, her mother, her grandmother, and her stepfather live in a kind of a boarding house. Some of the tenants are very much in full view, like Britt-Marie, who bosses everyone around about signs in the laundry room and strollers in the stairwell. Others are never seen, including the mysterious “Our Friend,” as Granny refers to him. Elsa’s mother works all the time, her remarried father is not a strong presence, and she resents her stepfather. Her grandmother is her rock. And then Granny dies. But before she does, she asks Elsa to deliver a letter. Elsa does, and sets off a chain of events that reveal the true nature both of Granny’s stories and of the people in Elsa’s life. Bit by bit, she comes to understand who these people are and how they came to be who they are. She also discovers her grandmother’s hidden connection to every soul in the boarding house. Elsa eventually discovers a mother who loves her unconditionally, a stepfather who’s actually okay, and a father who turns out to be important after all. She even makes a friend. She learns some things about adults that in the end, she knows she just has to forgive. While the protagonist of “My Grandmother Asked Me To Tell You She’s Sorry” is a child, this is not a children’s story. The heartache and sadness are all-too-poignant, and the adults’ stories are, well, adult. The story is about a child finding her way through the complexities of life by relying on herself and her memories of her grandmother. She learns the truth behind the tales, and adult truth is sometimes difficult and scary. Fortunately, there is enough humor in Elsa’s take on things that the book never becomes dreary—and I was pleased that the humor never condescended, even though the lead character is a child. I had a hard time deciding whether to categorize “My Grandmother Asked Me To Tell You She’s Sorry” as a fantasy or mainstream, even though the only fantasy elements in the story are Granny’s stories. It’s a fairy tale, but although it has a happy ending, it is a realistic ending. Granny doesn’t come back to life. Britt-Marie was never a princess. “Our Friend” is not really a wurse from the Land of Almost-Awake. And yet, the fantasy carries the story. Read it and decide for yourself. We were supposed to meet Auntie Opu’ulani today at 9 am, so we set our alarm. This turned out to be unnecessary, but as we were getting ready to go, We got a call on the condo phone from Auntie saying she had to babysit her grandchildren that day. (I still don’t know how she figured out the number–remember my iPhone was sacrificed to the sea gods.) She’s pretty jammed for the rest of the time she will be here because of the upcoming Makahiki Festival. Makahiki is the ancient Hawaiian new year festival. It used to be four months long. It was a time when many of the repressive kapu were lifted, and there were athletic competitions, hula, games, feasts, and fun. Today it is a week long, and a celebration of Hawaiian culture. I am kicking myself that we are leaving just as Makahiki begins, but I probably wouldn’t have been able to do what I needed to do here because everyone would have been too busy. Asking the tourists to go with the flow on Moloka’i. As we walked down the road, we were greeted by a small, skinny black cat. I miss my kitty, so I stopped to pet it. It turned out there were several other small cats, employed on the farm to kill rats, who eat the nuts. We arrived in the middle of a tour. There was a wooden trough set up with whole mac nuts. There were holders made out out of old rubber tires and hammers to crack the nuts on pieces of stone in the trough. This is, of course, not how they are commercially processed. Mac nuts have a thick outer husk. The guy in charge of the tour bit into a husk and removed it to demonstrate. Then they have a very hard inner shell. If you whang them with a hammer, you can get at the nut meat inside. This was being directed by a short, fit Hawaiian with an attitude. He was the first Molokaiian we have met who was not pleasant, and the feeling we both got from him was open disdain. After the nutcracking exercise, we tasted roasted and salted nuts (all natural, no other chemicals like the preservatives in canned or packaged nuts. Nothing added but sea salt, according to our surly host. ), then got to taste raw coconut dipped in macadamia flower honey, which is not made on the farm. That was delicious and different. As this was going on, I noticed a dark, raffish-looking fellow with gold chains who was looking on, extracting raw coconut from a shell and throwing pieces for the cats to eat. The cats all scrambled for this coconut as though it were Li’l Friskies. The grove of nut trees was immaculate. They don’t pick the nuts; when the nuts are ripe, they fall to the ground and they are harvested daily. The ground was absolutely bare between the trees except for a few piles of leaves that had been collected. Like coffee, mac trees have flowers and nuts in every stage of development at the same time. After the mac nut farm, we drove to nearby Kualapu’u, which is where Coffees of Hawaii is. I wandered into the gift store intending to buy some coffees and spied the raffish cat-feeder. He was leaning casually against the counter, talking to the clerk. I agreed this was so and commented that the host there was the only unfriendly person we had encountered here. He said he brought tours over from Maui on the ferry, and he always told them that the guy worked with nuts all his life, and so of course, he was a little nuts himself. Clearly a stock comment that he used all the time. He also said the man didn’t like it when you played with his cats, because they had jobs to do. I didn’t ask how our crabby host felt about feeding his cats coconut. Tom went to the coffee bar and ordered two Mocha Mamas, the speciality of the house. This was sort of a coffee smoothie, with Molokai coffee, chocolate, ice cream, and whipped cream. Hardly any calories at all. It was delicious, but I couldn’t finish it. On the way out of town (which takes about 60 seconds), I spied a gift store tucked into the Kualapu’u Business Park. Tom patiently parked the car and I went in. I had nosed around in several gift stores, but no joy. Either the stuff was complete junk, or it was truly original, handmade, beautiful, and hideously expensive. It was reasonably priced, so I bought it, along with some pretty mother-of-pearl earrings that, if anything, were underpriced. I very much wanted a large, carved turtle for my bathroom wall, but my suitcase is already perilously close to getting charged for being overweight, so the turtle remained where he was. Given how dependent the ancient Hawaiians were on the ocean for food, and how much time they spent in it surfing, swimming and sailing, you wouldn’t think the ocean god would be a Satan-equivalent. But the ocean, too, can be deceptive, changeable, dangerous and cruel, so I guess it makes sense. After that, we returned to Paniolo Hale. I wrote the rest of the afternoon, and then we drove into Kaunakakai to the Paddlers Inn. This is a hopping’ place at night, and we had trouble finding parking. I went into the restaurant and looked around. A band was playing Hawaiian music in the corner. The room was filled, and the waitress said because we didn’t have reservations, and there was a large group of tourists that had to be fed, we would have to wait. I asked her if she knew Auntie Opu’ulani, and she shook her head. I saw the waitress who had served us before, an older woman, and asked her. She said yes, she knew Auntie, and pointed to a woman sitting at a side table. I went to introduce myself. Auntie Opu’ulani is a woman of about my age with dark, curly hair frosted with silver, and a wide, friendly face. She greeted me warmly, and then I set about trying to solve the seating problem. I had noticed when we came in that the bar was completely empty, and I asked our helpful waitress if we could get served in the bar. That suited me much better, anyway–it was quieter, so we could talk and actually hear each other. She said of course we could, so Tom and I and Auntie retired to the bar. I asked Auntie Opu’ulani about mo’olelo. She asked how I intended to use them. I said my motivation in learning them was to better understand Hawaiian culture. I did not intend to retell them, but rather to have them inform my story. Tom chimed in with a description of “The Obsidian Mirror,” and explained how that related to what I was doing on Molokai. She said she had learned the chants from her grandparents. She had been the 6th of 12 children, and her mother was ill when she was born, so her grandparents adopted her–very much in the old Hawaiian way. She said they had been born in the 1890’s. They were very strict, but loving. They believed that one’s possessions should be cared for, and that nothing was to be treated casually, as people do today. She loved them dearly, and they taught her the proper way to be Hawaiian, as well as the old chants. Auntie said the chants unique to Molokai had never been written down before, but that was her task now that she was retired. I asked about menehune, and she told me that her grandfather had seen one. He was walking in the high country and stopped to rest in the shade, but someone kept throwing nuts at him. He saw two small feet dangling from a branch, then a tiny man jumped down and ran into the brush. The menehune was warning her grandfather not to rest there. I asked if they were still around, and she said yes. There are plenty of places in the back country where they live. Menehune work closely with pohaku (poh-hah-koo, rocks), to build things like fishponds. By this, I think she means the rocks contribute as much a part of the work as the menehune. She said there are many things in the chants that actually exist. Her son, who loved to hike, once found a spring in the high country that flowed out of the rock, then disappeared back into it again–something described in one of the chants. He filled bottles with this water and brought it home. When Opu’ulani drank it, she thought he had added something to it because it was so sweet, but her son said no, that was just the way it tasted. Auntie believes the Ali’i, (ah-lee-ee, the upper class/nobility of ancient Hawaiian society) came originally from the Americas. (There is a generally accepted theory that they came from Tahiti. The mo’olelo refer to the original Ali’i coming from “Kahiki-nui,” or “great Tahiti.” However, DNA testing of any group of people is far from complete, and there have been some very surprising finds. for instance, DNA analysis of extremely ancient human remains found in Peru show direct a relationship with both the Ainu of Japan and with Australian Aborigines. So I wasn’t about to argue.) Her own ancestors came from Maui, she said, but when they got here, there were many uhane ino (oo-hahn-ay ee-no, bad spirits) who possessed peoples’ bodies, and the people had to get rid of them with prayer and fasting to live here. I told her the story of the doomed lovers that Leimana had told me, and asked what it had to do with the big turtle rock in the channel. She told me, but that is part of her mo’olelo, so I can’t repeat it. I said the story of the two lovers sounded like it really happened, and she said that it did. She agreed with me that it sounded like something two teenagers might do. I also asked about the heiau on Molokai. I had read that Molokai was known for its powerful sorcerers, and they had built this enormous heiau on the Maui-facing side of the island to intimidate potential invaders from that island. It was a place of much human sacrifice, and there is the story of a kahuna (priest) who lost seven sons to this practice. Auntie Opu’ulani confirmed the heiau as a place of sorcery. She used to take people from other islands on tours there (it is on private property and you have to get permission to visit). One day, she was guiding a group of kupuna (elders) from Maui. She and another lady sat down on some rocks to rest. Suddenly, the other lady jumped up and went directly back to the bus. Opu’ulani later found out that the lady felt that the rock was “trying to enter her.” She said the heiau was a bad place because of the human sacrifice, and if we visited, not to sit on the stones. Auntie Opu’ulani was exactly the person I had wanted to meet. Educated, dedicated to her culture, and a believer. I decided to tell her my experience with the lei at Kilauea. When I described turning around to find the lei gone, she nodded quietly and said, “Pele accepted it.” I asked her to read the manuscript for the book I am working on (once I actually have a manuscript), and I offered to pay her for it. She said she would be glad to. As we prepared to leave, I asked if I might contribute to her work, remembering what Jeanine told me about offering money, but Auntie would not accept it. 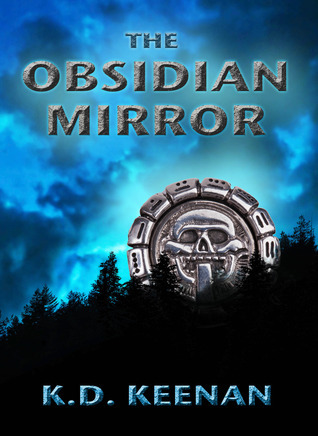 Of course, I offered to send her “The Obsidian Mirror” as a way of saying thank you, and this she accepted. What a beautiful, gentle woman. I am so lucky to have met her! But I don’t think we’ll be going to the heiau.